Faradic treatment or electrical muscle stimulation (EMS) uses the application of electrical pulses, which are applied on the body to stimulate the muscles to contract resulting in a tightening and toning effect. HOW DOES FARADIC SLIMMING WORK? The Electro-cellulite machine is designed to cater for professional slimming salons. New to this machine, we have added extra pads to the already existing 3 heat diathermy pads. There are now 5 heat diathermy pads that cover 2 x legs, 2 x arms, and a body pad. This gives full body coverage with the heat diathermy machines. 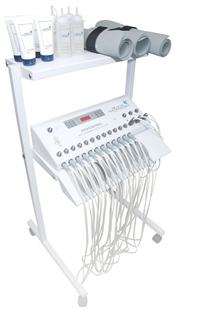 This fully computerised machine is designed to give either faradic, heat or both treatments to the body. The Health Tech nine program professional uses the very latest developments in computer technology to get rid of unwanted weight fast by warming the body and contracting the muscles simultaneously. The Electro-Pads are applied first and covered by the latest non-toxic Heat Wraps, a must for people with cellulite and flabby muscles. The nine selectable programs are designed to slim, tone and firm specific body areas at the touch of a button. Select the program, start the treatment, set the levels and the machine does the rest automatically. You will be amazed at the results of the electro cellulite machine, it quickly and effectively takes centimeters off unwanted fatty areas of the body. Use our cosmetic range formulated for use with the Health Technology machines. Faradic muscle toning. 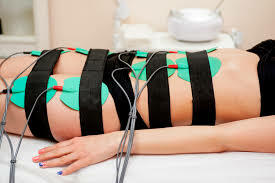 Well known as electrical muscle stimulation, this treatment is used to tone and tighten the muscles of the body. This treatment is known under many trade names all offering a faradic treatment. ... The muscles will contract at regular intervals as selected by the Therapist. WHAT IS FARADIC CURRENT USED FOR? A galvanic current uses mild electric currents that consist of positive and negative ions to stimulate the local muscles. ... The faradic current has a frequency of 50 Hz. It produces tetanic muscle contraction. By surging the faradic current, alternate contraction and relaxation of the muscles can be achieved. 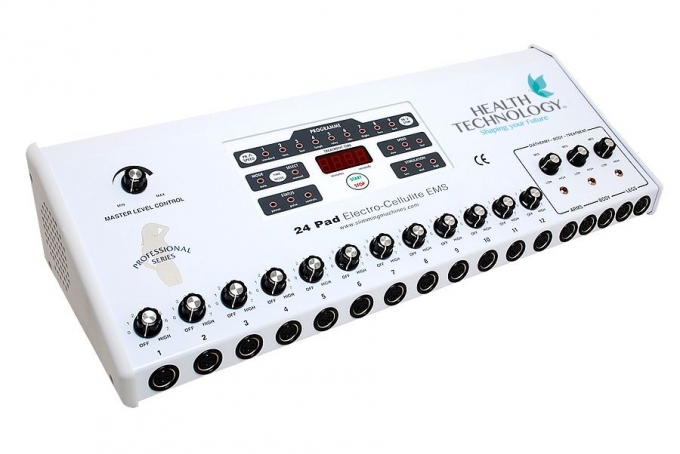 The selectable computer controlled impulse technology will produce the correct session of treatment for the desired result. Similar to normal exercise, the contracting of muscles stimulated by the brain, This technology program will contract and relax your muscle in the same fashion. The benefit of this being that you get a passive workout with less risk of injury or fatigue. This also gives the patient the option to work on a specific part of the body. The Faradic slimming microprocessor controlled programs are technologically advanced to vary cycling of many different programs. These programs are designed to effectively stimulate areas of the body correctly, thus giving the correct result. Muscle stimulation is also ideal for physically challenged individuals and those that are in need of physiotherapy for injuries and rebuilding. First you complete Phase 1 for 10 days then proceed to Phase 2 for next 10 days. Stimulating tonic designed to aid the healing and strengthening of the gastrointestinal tract and stimulate muscular movement of colon. It is anti-bacterial, anti-viral and anti-fungal. Total 30 capsules. take 3 capsules at night before you go to sleep. complete course for 10 days and then follow with Phase 2. Total 30 capsules. Take 3 capsules at night before you sleep. complete course over 10 days. Not everyone understands the importance cleansing and detoxifing the body. Our modern lifestyles have increased the amount of toxins accumulating in our body through processed foods, ready meals, stress and even something as ordinary as our tap water. Detoxifying the body is beneficial for everyone – by cleansing the body, you prepare your body to lose toxic fluid, which often includes fat that is no longer required by your body as an area to store toxins. After the first few days, you will experience a change in bowel movements. Stools may become more watery and more frequent, which indicates the product is starting to work. This will reduce in intensity over the first week of use. How Often Can I Use A Colon Cleanser? Some people may experience some initial minor stomach cramps which should shortly disappear. Of course an increase in bowel movements is to be expected. We recommend following a healthy eating regime whilst using DetoxPlus. It is also recommended to avoid heavily spiced foods to avoid digestive irritation. Drinking plenty of water, ideally 1-2 litres per day, will help keep the products active though the body. DetoxPlus+ is best taken for one month before dieting to remove the waste matter stored in the colon, or alongside a diet product. This will allow you to diet more effectively, and shed pounds of waste that most slimmers mistake for bodyfat. If you require further detoxing, we recommend that a one week gap is left between detox months to allow your internal system to return to its normal pace. We do not recommend detoxing for more than 3 months in one go. Once or twice per calendar year is sufficient for most dieters and men and women who want to stay alert, active and clean, inside and out. hi I have started detox plus is it okay to take at night even though I will not be sleeping,I work nights. STAFF REPLY: We would suggest taking it when you wake up and before you go to sleep, rather than the traditional morning and night. Just received my first bottle of detoxplus today will start along side raspberry ketone. I am so excited can't wait to see how much I will loose. 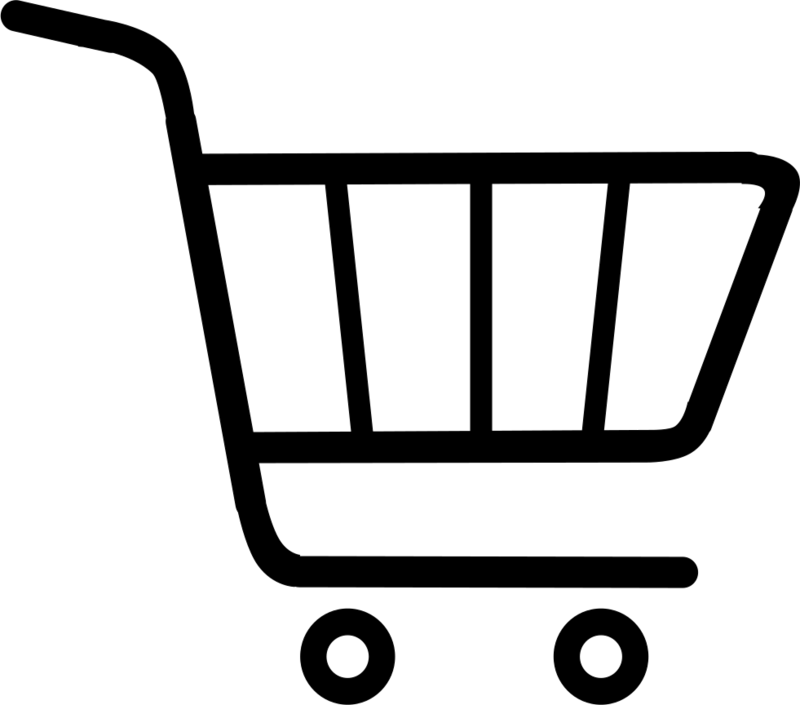 I am really impressed with the quality of service received and how quickly I received my product. Have been taking the detox-plus colon cleanse for about 3 months now and stopped. However, I been taking the raspberry ketone plus and Garcinia Cambogia for over six months and I must say that I am more than impressed at how much weight I have lost so far. I don't feel bloated any more and have reduced from 100 kilos to 80 kilos within the space of 6 months without having to punish myself. These products are very natural and doesn't cause any strange feelings to the body. I totally swear by them. Thanks evolution slimming and keep up the good quality products! My gosh this works. I'm only small so I take half the recommended dose, but dont plan to cut down to half again as they suggest to do after 15 days. Without I visit the loo about once a week if I'm lucky, with them I visit once maybe twice a day, with about half a days delay before seeing reults after taking the dose. Hi i have bought Hiprolean x-s high strength and detox plus....... and i was just wounder if you can take it together ??? Despite being slim I've always suffered from constipation and bloating. I can literally look like a stick with a balloon stuck down my top - not the most attractive! Although I've only been using the Detox Plus Colon Cleanse for a week, I have already noticed a marked difference. I'm less bloated after meals and feel less sluggish. I'm looking forward to seeing the results after a month, especially when used in conjunction with the Acai berry supplement which I have also found excellent. Excellent product. Nice to see instructions on the pot! Does what it says for a good clear-out without any horrid side effects. Would recommend and buy again in six months' time. I bought this product as my stomach problems had started to severely impact my life daily. What started off a couple of years ago as occasional bloating and soreness had got to the point where every day I was in pain, swollen and had severe constipation. My doctor had tried me on IBS tablets that had not worked, I had trialled cutting out wheat, dairy etc but unless I stayed on fluid felt lethargic, sore and uncomfortable which has impacted my social life. I can honestly say after taking the detox tablets for only 1 week I feel like a different person. From day 2 I saw a difference and since day 3 have had no pain, bloating and had regular bowel movements. It is the first time in years I have felt normal and had more energy and less sluggish. I have also lost 6lbs in my first week, which for me was not my key aim but an added bonus. I just hope following the cleanse that my body remains feeling this way! This product certainly make you go to toilet more frequently which make you feel 'lighter' so I do like it. Still using them - kaz "kaz"
On the jar it says you can take two a day but I found I could only take one at night. If 1 a day I found this product fine. Alfalfa - Rich in chlorophyll it has strong blood cleansing and building properties. It contains all 27 vitamins and aminos, 28 minerals and antioxidants. Alfalfa is wellknown as a nutritive tonic which cleanses and detoxifies the body. Barley grass - Barley grass contains one of the highest known herbal quantities of blood purifying chlorophyll. Psyllium hulls - Supports healthy bowel movements and improve the body’s ability to absorb nutrients. Slippery Elm - A highly nutritive tonic food for all conditions of deficiency. It helps to rebuild the body at a cellular level and calms inflamation. High in niacin, riboflavin, thiamine and vitamins E, F, and K. It also contains the minerals calcium, iron, sodium, selenium, iodine, copper, zinc, potassium. Liquorice root - A natural anti-inflammatory which aids in the relief of muscle spasms and inflammation. Licourice root will help expel excess toxins and mucus from the bowel. Other ingredients: Vegetable Cellulose (preservative-free, from capsule shell). NO corn, soy, salt, yeast, wheat, milk and egg products, sugar, or preservatives. Begin with 2 capsules in the morning and 2 capsules in the evening. Do this for one week. The next week take 3 caps in the morning and 3 caps in the evening. The next two weeks take 4 capsules in the morning and 4 capsules in the evening. Once you have done this, if you think you require more cleansing, you may repeat this same sequence with another bottle of capsules. In general best results are obtained by taking Colon Detox for 5 to 8 weeks. Colon Detox is not designed for continuous use and generally 2 bottles of 240 capsules is adequate. Do not take more than 3 bottles continuously, as the effect may be too strong and you don’t need it. You can take the Colon Detox at the same time as taking the Intestinal Parasite Cleanse capsules but the Intestinal parasite Cleanse capsules are best taken with food. During the 5 to 8 week cleanse you must drink plenty of water or abdominal cramps may occur. With every serve of Colon Detox capsules drink 8 ounces of water or juice. In between meals drink extra water – ideally you should drink 65 to 70 ounces of water, herbal tea, weak black tea or juices every day. This Colon Cleanse will not be as effective if you do not drink adequate fluids. You need to drink lots of water while doing a bowel cleanse and warm water is preferable. The warm water will stimulate the muscular contractions of the intestines (peristalsis); whereas cold water is not as effective at this. Drink at least 70 ounces (2 litres) of water a day.